802-BIKEGUY | Bike pedals before gas pedals! I’ve owned the bikearizona.com domain name for many years, and I’ve finally found a proper use for the domain. A statewide bicycle events calendar. There are many bike groups in the state and keeping tabs on local rides is difficult. I decided it’s high time someone aggregate as many as possible into a single calendar. Right now it’s mostly greater Phoenix area focused and I think I’ll add a separate “Tucson” area calendar soon. If anyone is interested in helping me aggregate events and keep the calendar up to date, I will certainly welcome the help! The Congress recognizes that bicycles are the most efficient means of transportation, represent a viable commuting alternative to many people, offer mobility at speeds as fast as that of cars in urban areas, provide health benefits through daily exercise, reduce noise and air pollution, are relatively inexpensive, and deserve consideration in a comprehensive national energy plan. Yes, that’s right, our nation’s 95th Congress (1978) stated this in Act 682 of the National Energy Conservation Policy Act (Public Law 95-619) of November 9, 1978. Not more than one year after the date of enactment of this Act, the Secretary of Transportation shall complete a study of the energy conservation of potential bicycle transportation, determine institutional, legal, physical, and personal obstacles to increased bicycle use, establish a target for bicycle use in commuting, and develop a comprehensive program to meet these goals. In developing the program, consideration should be given to educational programs, federal demonstrations, planning grants, and construction grants. The Secretary of Transportation shall submit a report to the President and to Congress containing the results of such a study. Other disincentives (e.g., lack of knowledge about good routes). Lack of communication and coordination. I’ll just say it, if were it up to me, every major street in Tempe would have a dedicated, separated, bike lane. Yes, I’d take out a lane of traffic on major streets to to do it if that were the only way. Yes, I’d be happy to take the phone calls from people who say it will increase traffic on streets and threaten to vote me out of office. If I were not only 1 of 7 votes on Council, cyclists putting their lives at risk every time they rode a bike would end starting today. We need all bicyclists to take action, because we certainly can’t rely on the 113th session of Congress! Are you getting frequent flats on your bicycle? I’ve seen all types of flats and the sometimes crazy reasons that cause them. I’ve even seen a flat caused by a bullet. Most flats are obvious, some are not, and sometimes you get stuck in the “frequent flat” routine. Let me first start by saying that under inflated tires are often the cause of many flats. Low pressure makes your tire more susceptible to thorn type punctures as well as pinch/snakebite flats where the tire bottoms out against the rim thus pinching the tube. Ideally you should check your tire pressure before each ride. If you’re getting frequent flats you really need to get methodical about discovering the cause. The first thing I suggest you do is go buy a paint pen, I like silver. Now, when you install the tube, put a big X on a specific SIDE of the tube. Anywhere you like is fine. This “keys” your tube. Now, install the tube with the X facing the DRIVE SIDE of the bicycle. The drive side is the crank side of the bike. Line the X up with some identifying feature on the tire (most tires have logos). If the tire has no identifying feature or too many logos, make one on one sidewall with the silver pen. If your tire is directional make it on the drive side of the tire. Now, with the X on the tube lined up with the identifying feature on the tire, install it so that they both line up with an identifying feature on the rim. This can be a sticker, a scratch, a mark with your paint pen, the rim seam, anything you can identify. Wheels are directional too, if your hub has a logo you should always install the wheel so that you can read the logo when sitting in the saddle, again paying attention to how you install the tire onto the rim if the tire is directional. Now next time you get a flat you can identify the EXACT spot on the rim, tire and tube where the flat occurred. Take your tire and tube off the rim and begin an inspection. Inflate the tube to figure out where the puncture in the tube is located. If the puncture is on the tread side of the tube, line the X on the tube up with whatever identifying feature of the tire you used and inspect the area of the tire that coincides with the puncture in the tube. Run your fingers along the inside of the tire feeling for anything sharp. Push the tread inwards and use a headlight on the inside of the tire so you can get a good look. I’ve seen cases where a small metal thread (from a blown out car tire carcass) can get embedded into a tire. Those little strands are nearly invisible and can cause repeated flats. Be prepared to get your fingers pricked and have a nice pair of needle nose pliers to grab any offending objects in the tire. Inspect the entire tread area of the tire for embedded objects, remove these too as over time they can work their way through to the tube. If the puncture is on the rim side of the tube, line everything up and start looking at the rim in the location of the puncture. Rim punctures can be caused by many things. Often times it’s a rim strip issue or a metal burr on a spoke or spoke hole. It’s important to use a quality rim strip. The cheap rubber ones are not really acceptable except for single wall rims. If your rim is double wall use a quality high pressure rim strip of the proper width. The strip should cover the spoke holes but not be so wide as to interfere with the seating of the tire at the bead. I regularly install KORE, FSA, Origin8 and Velox tapes. In rare cases poor engineering of the rim can cause flats. A few times I’ve had to install thin rubber tubing into a groove in the center of the rim and then cover it with rim tape because the tube was thinning out so much when filling into the groove that it would fail simply from friction. If you’re just getting regular pinhole type punctures in the tread area and there’s nothing embedded in the tire it’s just dumb luck. Investing in better tires is one way to reduce flats. There are many tires on the market that have some type of built in puncture protection, some are better than others and those often come at a higher price. When it comes to tires you really get what you pay for. For puncture resistant performance road tires I often recommend Continental Gatorskins. For relaxed commuting and touring I recommend Schwalbe Marathons or Michelin Pilot Sports. There are of course other choices but I don’t have much experience with them. Vittoria’s Randonneur line, Michelin City Proteks and the uber bargain CST Selecta which are actually pretty decent albeit with limited size choices. If you can’t afford puncture resistant tires or can’t bear to replace your perfectly good barely worn tires, consider tire liners. They work but I would avoid using them in narrow road tires. Mr. Tuffy used to hold the trophy for best liners but now I have to recommend Rhinodillos for the best protection. A tire liner goes between the tube and the inside of the tire. It deflects objects that pierce the tire. They do reduce flats but as the saying goes, there’s no such thing as “flat-proof”. Tire liners do add weight, the Rhinodillos are hefty and they do not make a “light” version like the Mr. Tuffy Ultra-Lites. Another option is a tube sealant. Slime is JUNK. It eats away the bond between rubber and brass so eventually you get a bubble around the valve stem and you flat. I’ve seen it many times. We use an alternative at the shop. Flat Attack. It uses fibrous material versus the rubber chunks in Slime and it doesn’t cause the valve stem separation issue as far as I can tell. Personally, I use Stans NoTubes in my tubes. Stans works wonderful, the only downside is that it dries out quicker and you must add more in as little as 3 months depending on the atmospheric conditions in which the bike is used and stored. Stans is actually a latex rubber based product and when it cures it cures as a latex rubber. Slime and Flat Attack don’t cure, they just clog and dry up in the puncture. Stans is also intended for tubeless applications. The thing to remember with sealant is that it doesn’t always seal the hole the first time. With Slime and Flat Attack if you get a puncture and can hear air escaping you need to get that puncture facing the ground so the sealant can flow and be forced into the hole by air pressure. If the puncture seals and you park the bike with the puncture at the top of the tire the sealant can run away from the puncture and allow it to leak again. If this happens, re-inflate the tire and ride the bike so the sealant is distributed along the inside of the tire. Alternatively face the puncture towards the ground and let gravity get the sealant there. With Stans NoTubes you shouldn’t have this issue once the puncture is sealed as when the Stans is exposed outside the tire it will cure up to rubber. Lastly, I feel it pertinent to include some thoughts on “airless” or “solid” tires. I would avoid these entirely unless you’re riding through something akin to a warzone and absolutely need to eliminate flats. Solid tires offer no pneumatic cush and will destroy your rims and hubs quite quickly. Your spine and kidneys may also suffer from the bone jarring ride of solid tires. I hope I’ve covered all the situations that cause frequent flats and there are many ways to reduce flats significantly. If I’ve missed something please contribute in the comments! If you want to ship a bike cheaply there is one thing you need to know. That is, how to avoid oversize fees by choosing the right size box. If you avoid oversize fees you should be able to ship any standard size bike from coast to coast for $75 or less (as of Oct 2012) with FedEx. The shorter the physical distance the cheaper. I’ve always found FedEx rates to be lower than UPS. To avoid oversize fees the length + girth (height x 2 + width x 2) of the box must be 130 inches or less. Most bike boxes are 8″ wide, range from 29″ to 31″ tall and 51″ to 54″ long. For a box that measures 54″ x 30″ x 8″ the equation is 54 + (30 x 2) + (8 x 2) = 130″. Once you go over 130 inches, you can expect the cost to double due to oversize fees. So, if you’re going to ship a bike and you’re looking to your local bike shop for a box, make sure to get the measurements. If you don’t know how to pack a bike leave it up to your local bike shop to do so, labor charges vary but figure at least $50. If you want to learn how to pack a bike into a box, this is a good two part video. Zip ties, many of them! * less modern bikes may require different tools including such things as small metric wrenches in the 8 – 10mm range. Having attended a small kids focused community bicycle event earlier today, I must express my disbelief at the sad shape of most of the bicycles at the event. The environment takes a heavy toll on disused bicycles. UV and heat degrade all the rubber, plastic and paint. As they’re haphazardly moved from place to place in garage, shed or backyard, the components and wheels are often dinged, dented or simply broken beyond repair. Some even suffer serious damage from a misjudged car parking job. Most of the tires were one curb or pothole impact away from blowing out due to dry rot. Wheels were wobbly, chains rusted, brakes barely functional and bolts were loose. It’s mind boggling to me that parents let their children ride these klunkers, most without a helmet! Do you and your children a favor, show the family bikes some love! If possible, store your bikes inside the house, climate control will extend their service life significantly. This is not a specific jab at all Park Tools. Park makes wonderful tools and we have many here in the shop, but as far as cable cutters go, go Pedro’s! And no, the warranty pair of Park cable cutters has not been mistreated, nor is the pair of Pedro’s brand new. I spent most of the month of March away from biking, time to bring it back. April is the Valley’s Bike Month, one month before the rest of the country due to the impending hot weather. 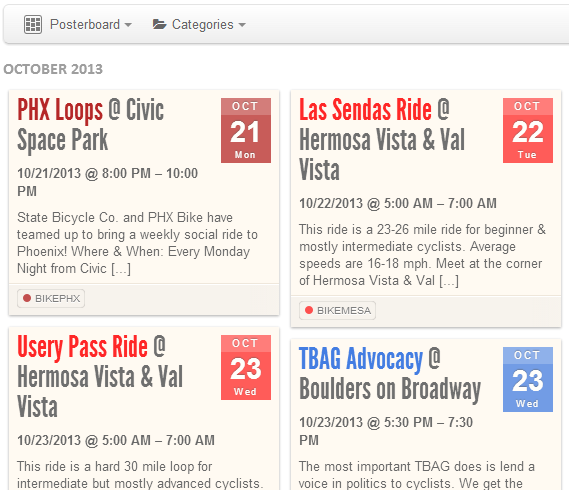 Rather than post all the events here, hop on over to Tempe Bicycle Action Group’s Bike Month Post. In May I’ll be doing some bicycling in Santa Barbara, CA and visiting the Bike Station there. Looking forward to it. This fall I may actually make the C&O Towpath/GAPT 330 mile bike camping trip happen, we’ll see. 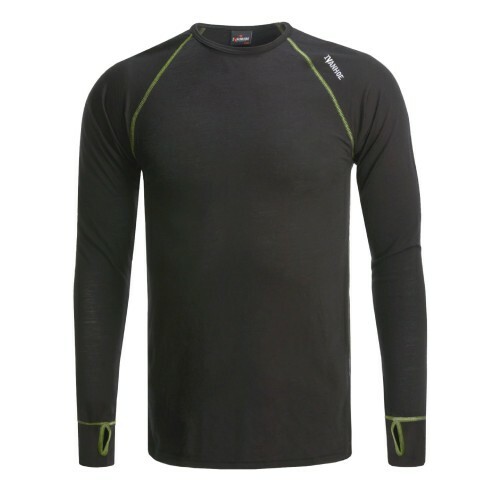 The ideal base layer is one that is form fitted (but not too tight) and wicks away moisture to the outer layers. You want either technical fabric (sold under many brand names) or wool. 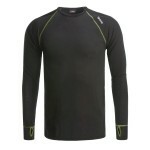 Your baselayer can be short sleeve, long sleeve or sleeveless. You can use multiple base layers such as a sleeveless shirt over a long sleeve shirt providing extra protection at your core. Base layer examples. After the base layer comes one or more insulating layers. Fleece is a very popular insulating layer and is available in varying thickness and configuration. 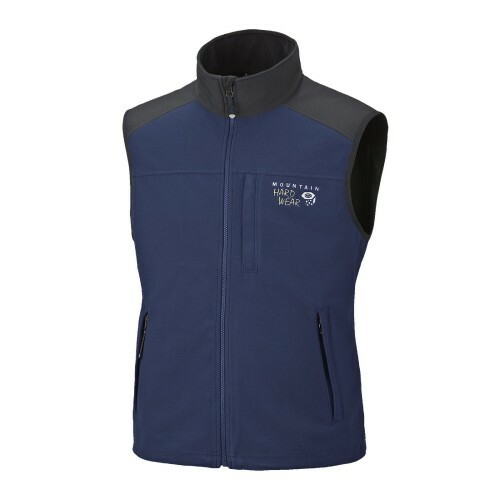 I often recommend a fleece vest (rather than long sleeves) as the vest keeps your core warm but allows some heat to escape from your armpits. Insulating layer examples. The last layer is your outer layer that protects you from wind and water, often resistant or proof. A wind resistant outer layer on a bicycle is key, if you’ve ever watched bicycle racing events you may have witnessed riders stuffing newspaper up their jerseys as they hit a long descent after a long climb. The newspaper protects their core from wind chill on fast descents. 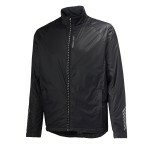 A shell jacket is a popular choice and provides excellent protection from wind and water. 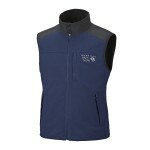 Alternatively there are fleece technologies that also block wind such as Gore Windstopper. If you live in a warmer climate you may just want a windproof fleece/softshell as your outer layer. 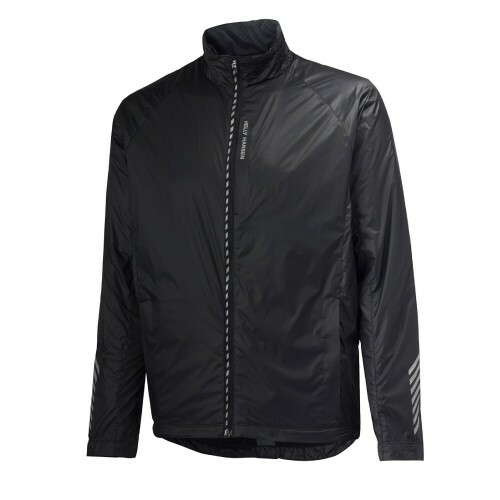 Features on an outer layer may include pit zips to allow heat to escape. Other apparel that can be added into the mix are arm, leg or knee warmers which can be put on or stripped off quite quickly as things cool down or heat up. A thin helmet liner is an option for keeping your head warm, or simply taping your helmet vents closed can keep things warm. Gloves are important, and can be found with Gore Windstopper technology. There are also toe/shoe covers to keep your feet warm and protected from wind/water. This past Friday I did two bicycle related things I’d not done before. First time on a single speed mountain bike and first time on a fat bike. What is a fat bike? 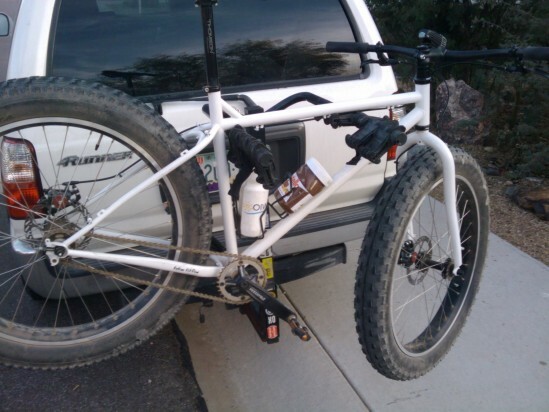 A fat bike (or snow bike) is a bike with REALLY wide tires. 3.5″+ wide. Surly has two models in their lineup, the Pugsley and Moonlander. Salsa has one, the Mukluk. What are the benefits of really wide tires? There are several. First, the wider tire has a larger air volume. Larger air volume means the tire can act as a suspension of sorts, absorbing impacts with any number of obstalces. Second, the tire is run at lower pressure, as low as 8 psi. This allows the tire casing to deform as it encounters obstacles, again acting as a suspension but also increasing traction as more of the tire is in contact with the ground at any given time. Third, the contact patch is larger. The larger the contact patch the more float the tire has and the easier it rolls over soft surfaces like sand and snow. The larger contact patch also lessens the impact to the trail. Combine all these benefits and it equals serious FUN. I was riding on the west side of the Estrella mountain range, where the roads are mostly sandy, occasionally as deep as beach sand. Off the roads the surface varies from hardpack to 4″ – 6″ riprap. Topography varied from flat to rollers much like those found around the buttes at Papago Park. The Pugsley I was riding rolled over all these surfaces with relative ease. While deep sand required more effort, the tires did not bog down like an ordinary 2″ wide mountain bike tire would have. I was especially impressed with the ride quality over 2″ – 3″ gravel, the aired down tires made it feel as if riding an ordinary bike on hardpack, quite smooth. Another terrain where the wide tires excelled was riding over channels in the sandy soil as much as 12″ deep and two feet wide created by rainwater draining to lower elevation. An ordinary bike tire impacting the sharp edges of the channels would have cut in like a knife slowing the bike significantly. The nearly 4″ wide tires however, rolled over and through these channels quite easily. I’m pretty sure I had a big goofy grin on most of the ride and every time new terrain was conquered I’d often laugh with amazement. I was also amazed that I really didn’t miss a geared drivetrain much, 32×19 was a pretty good ratio for a fun roll through the desert.